We are once again called upon to decide on the fate and future of our nation, and this grave responsibility ought to be foremost in the minds of every registered voter. Therefore, everyone should be fully aware of the basic procedures involved on Election Day itself. 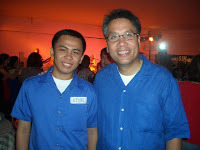 It bears remembering that once again, the election will be using the PCOS machine, which was introduced to the voting public for the first time in the presidential elections of 2010. The process is similar to the traditional manual voting method in many ways. After verification of voter’s identity, the election official presents the voter with a ballot. Since the ballot will be fed to a machine for counting, the similarities end there. 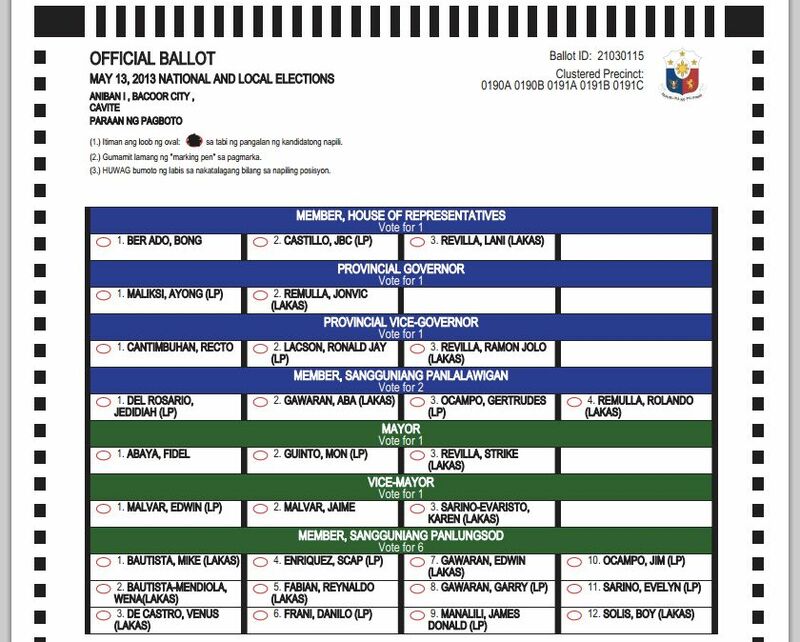 The ballot is filled out by shading the oval placed next to the name of the candidate. When it comes to shading the ballot, there is no need to be apprehensive about doing it wrong. The requirement is that the oval be shaded fully. But, for as long as over 50% the area is shaded, the vote is still counted and valid. Now, in situations where the voter shades two spaces for one position (overvoting) the whole ballot would not be invalidated. But the vote for that particular position is invalidated. Know the issues that you value. Before listening to various political platforms, you must first know the issues that are important to you. Write these down and hold them up against each candidate’s platform. For example, if you value women’s rights, identify those who will fight to enhance, preserve, or protect these once they are elected. When you have identified the issues, it will be easier for you to trim down your list of candidates. Read between the lines. Of course, most candidates could just be bluffing to get your precious vote. Don’t fall for sugar-coated statements. One good way to know if a candidate is indeed a wolf dressed in sheep’s clothing is to look at his track record of government service. Remember, actions speak louder than words. Know the qualifications of the candidate. This is a very important thing to keep in mind for obvious reasons. A candidate, once voted into office, must be able to perform the responsibilities the position requires. At the very least, the candidate must be capable of analytically and critical thinking. And so should you, the voter, especially during election season. Know your voting precinct. 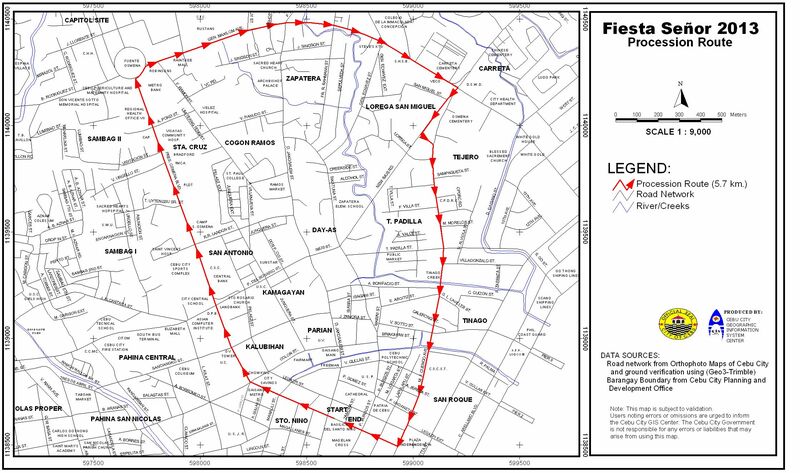 Take note of the voting precinct where you are registered as a voter prior to May 10. This is very important so you can avoid undue stress on voting day. Don’t make it more stressful than it already is. Remember, it’s going to most likely be hot, and there will surely be very long lines you’ll have to deal with. If you want to vote, make sure nothing or no one stops you from voting. Stand by your principles and be true to what you believe in. Remember, your vote is your voice. Vote conscientiously, and make it count. A registered voter is given only one ballot. In case a voter makes a mistake (shades the wrong space corresponding to a candidate’s name, then he or she would have to live with it. The best thing to do is to make sure that no errors are made since there are no second chances. There are no proxies as well when the time to insert the ballot into the machine comes. Once the voter inserts the official ballot, it is counted as one, marked by a tick on the counter. Good to know: What makes the ballot secure? Each ballot is equipped with a barcode that is in itself unique. The main purpose of this identifier is for the ballot to be counted only once. This security measure ensures that validity of the vote. The PCOS machine is equipped with a couple of security measures as well. First of all, each PCOS machine is assigned a specific precinct. It will not accept ballots that are not meant for that particular precinct. And the PCOS machine has a lens that has the capability to detect ultraviolet (UV) ink. The machine scans for this before accepting the ballot being fed to it. 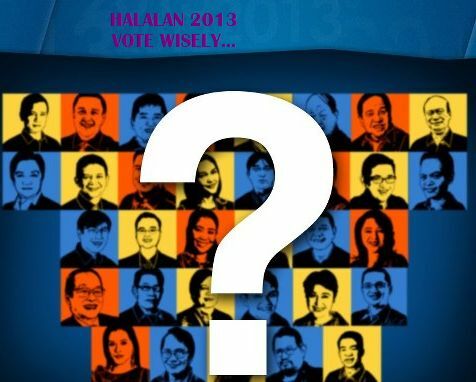 How to Vote on Philippine Election Day? In the balmy tropical country of the Philippines, Cebu has become a byword for “beach”. 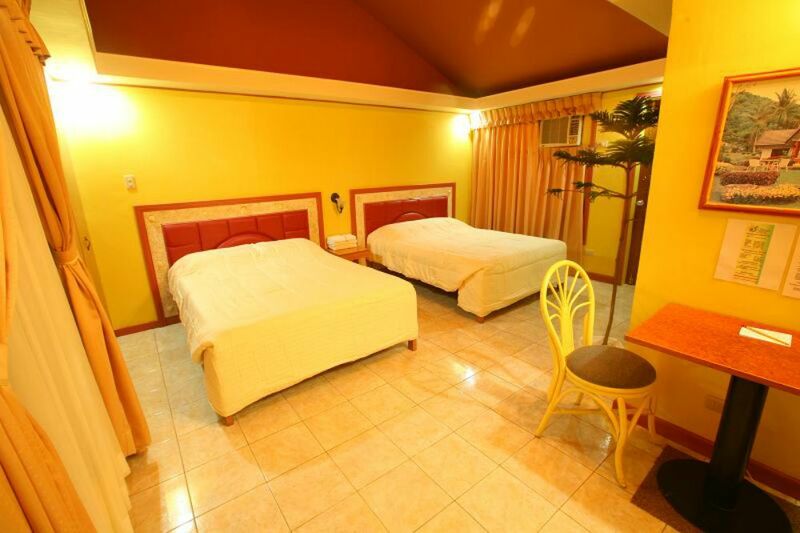 Natural white beaches, a slice of the blue Pacific, coral gardens and tropical fishes await you. The entire province is ringed with beautiful beaches and enticing islets. Your options are endless. 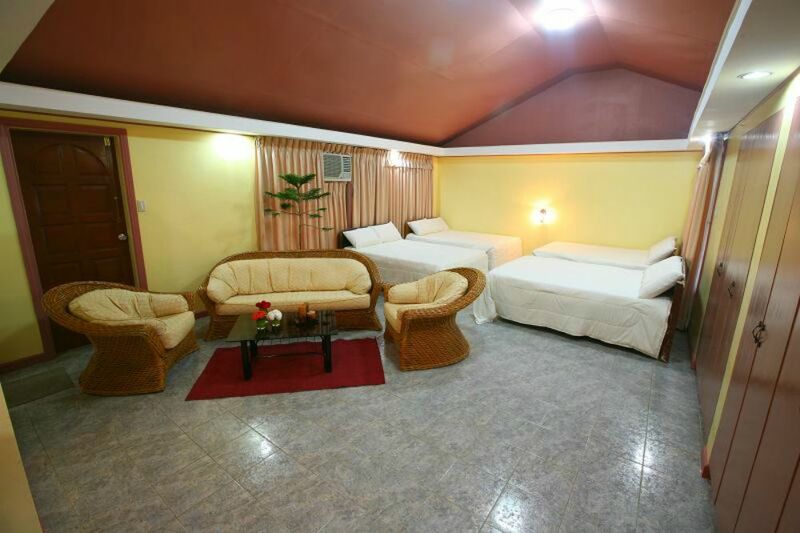 The San Remigio Beach Club is northern Cebu’s answer to life and leisure combined. 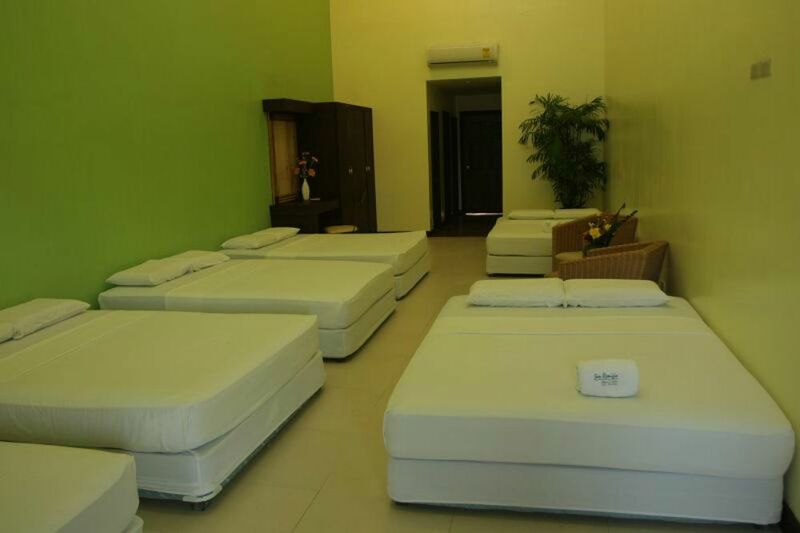 We have 51 rooms ranging from the comfortably spartan to the gratifyingly luxurious, food outlets serving up savory cuisine, a wide choice of sports facilities, all set up in refreshingly natural surroundings of coconut trees, sand, shore and sea. To complete the San Remigio experience, one has to reach beneath the island’s surface, literally, and see beauty that takes your breath away. 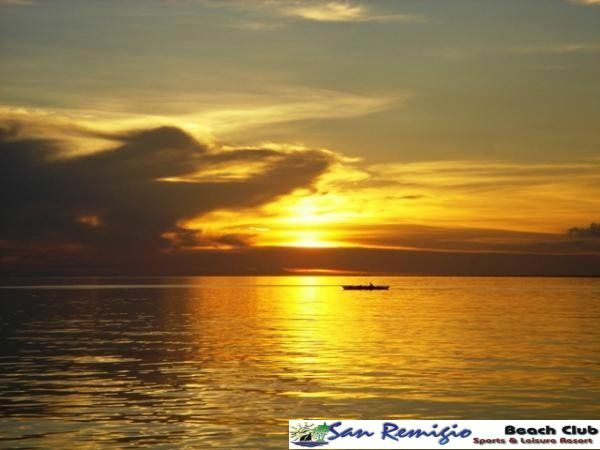 Scuba diving off the waters of San Remigio is an experience certain to give you many beautiful memories. 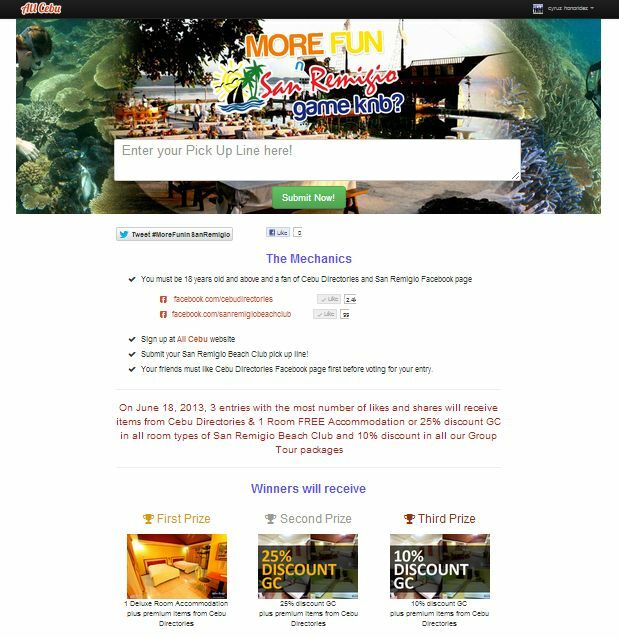 On June 18, 2013, 3 entries with the most number of likes and shares will receive items from Cebu Directories & 1 Room FREE Accommodation or 25% discount GC in all room types of San Remigio Beach Club and 10% discount in all our Group Tour packages. 2. 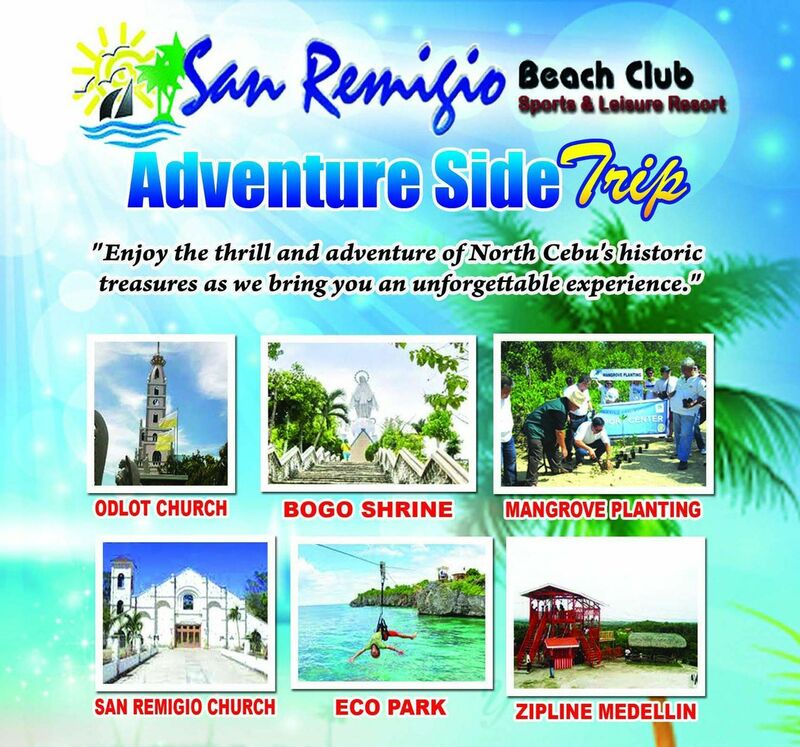 Sign up at All Cebu website Submit your San Remigio Beach Club pick up line! 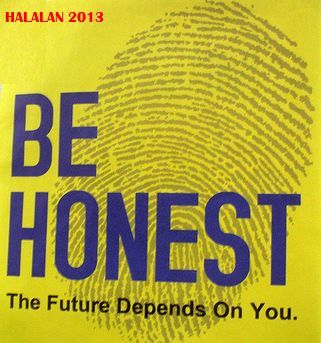 Your friends must like Cebu Directories Facebook page first before voting for your entry. 3. 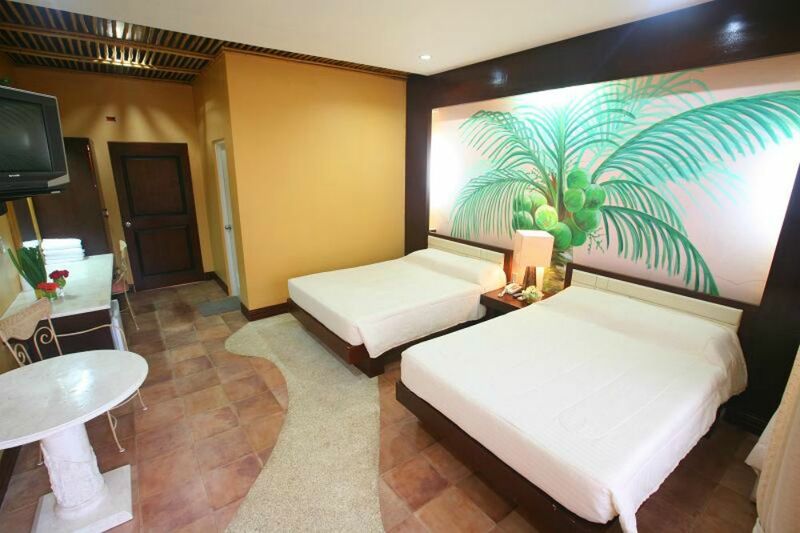 On June 18, 2013, 3 entries with the most number of likes and shares will receive items from Cebu Directories & 1 Room FREE Accommodation or 25% discount GC in all room types of San Remigio Beach Club and 10% discount in all our Group Tour packages. JOIN! MORE FUN ‘n San Remigio Beach Club. Submit your pick-up lines and share to your friends how expectacular your summer get away this 2013. 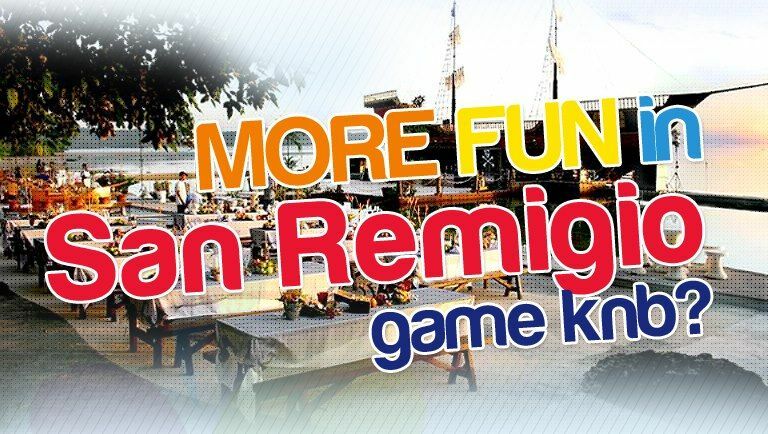 2.Sign up at All Cebu website Submit your San Remigio Beach Club pick up line! 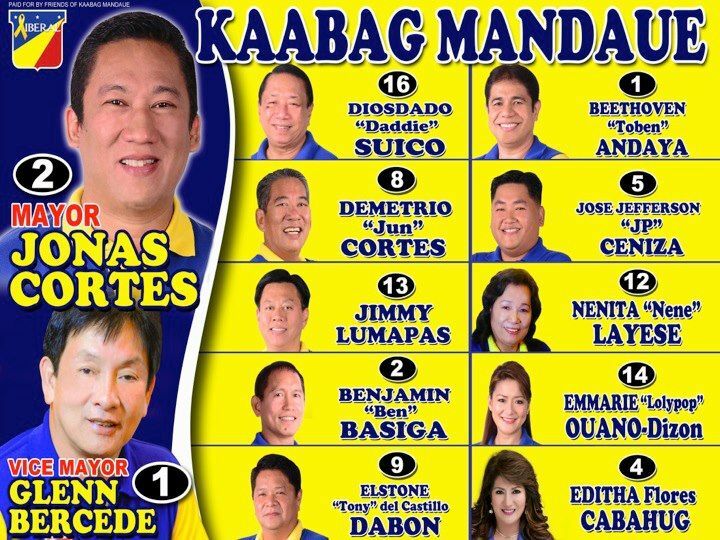 Your friends must like Cebu Directories Facebook page first before voting for your entry. 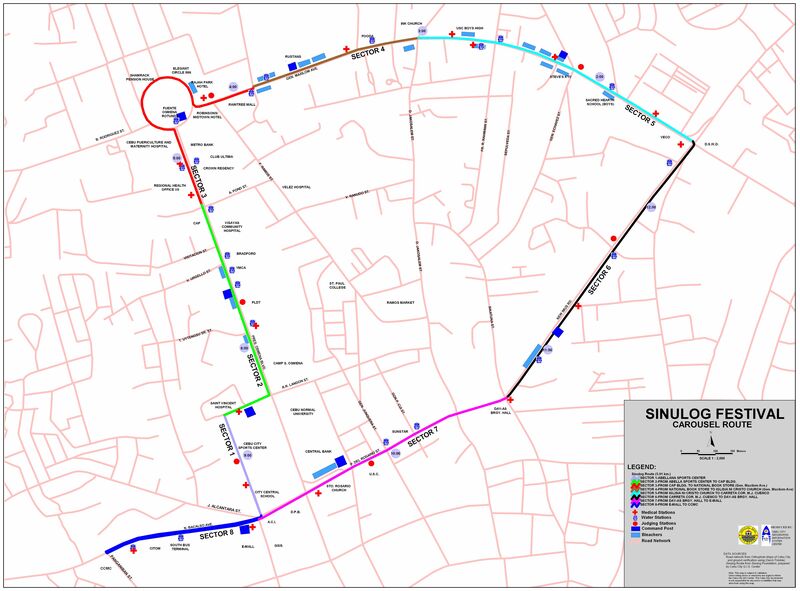 The Sinulog is an annual festival held on the third Sunday of January in Cebu City and Maasin City, Southern Leyte, Philippines. The festival commemorates the Filipino people’s pagan origin, and their acceptance of Roman Catholicism. The festival is an adaptation of the ati-atihan festival in kalibo, aklan. The main feature is a street parade with participants in bright coloured costumes dancing to the rhythm of drums, trumpets and native gongs. 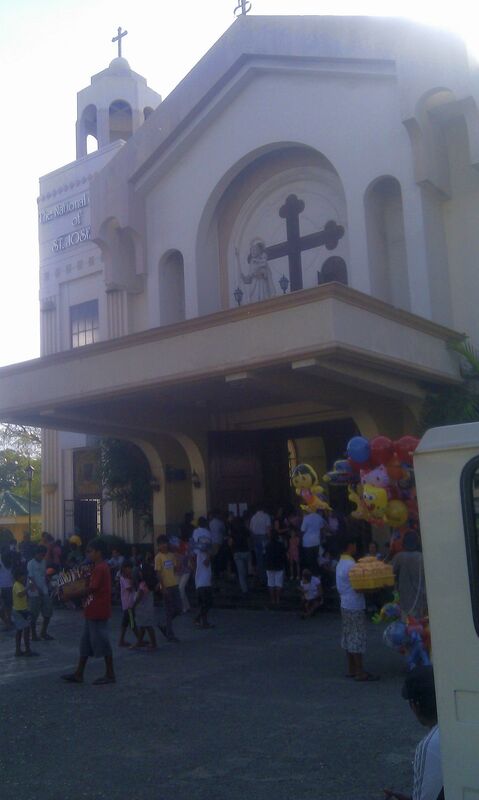 Smaller versions of the festival are held in various parts of the province, also to celebrate and honor the Santo Niño. 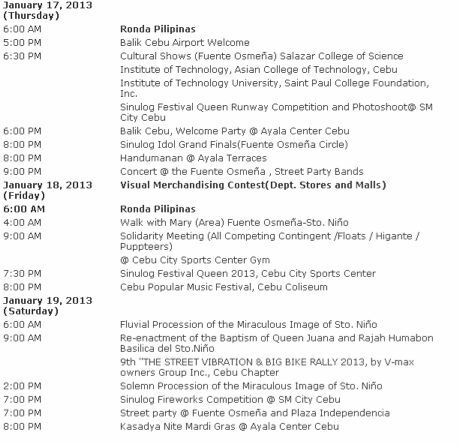 There is also a “Sinulog sa Kabataan” performed by the youths of Cebu a week before the parade. Recently, the festival has been promoted as a tourist attraction, with a contest featuring contingents from various parts of the country. 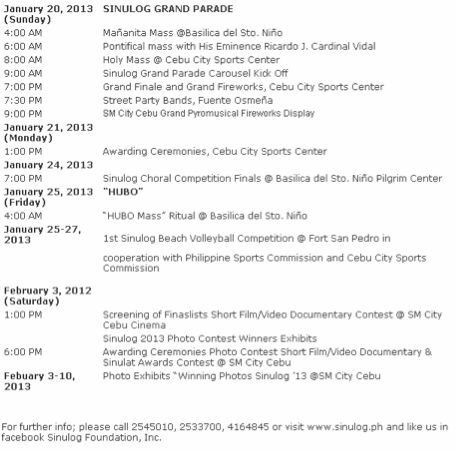 The Sinulog Contest is usually held in the Cebu City Sports Complex. Mandaue Chamber of Commerce and Industry (MCCI), a local partner of the Philippine Chamber of Commerce and Industry (PCCI) is composed more than 200 member companies ranging from micro to large corporations located in MandaueCity, the industrial hub of the Province of Cebu. Every August, we organize our flagship event – the Mandaue Business Month (MBM), where we hold series of events and projects geared towards promoting sustainable and socially-responsible entrepreneurship as we strategically position MandaueCity to be an attractive destination for business and investment. 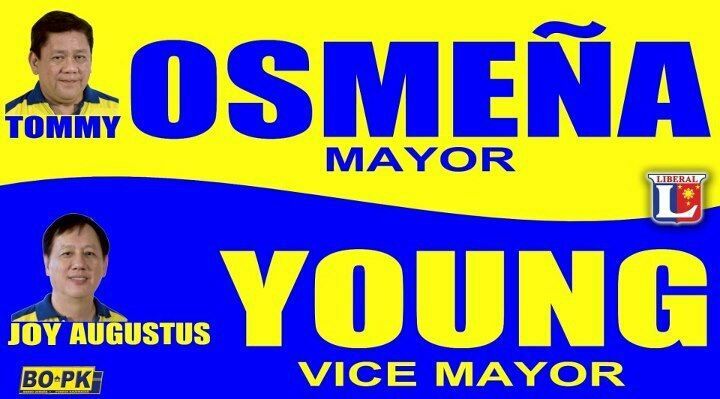 The Mandaue Chamber of Commerce & Industry is organizing a Basketball tournament dubbed as MCCI Playoffs 2012 – a friendly tournament among its members to promote camaraderie and sportsmanship. This event also hopes to increase awareness of the physical and health benefits of engaging in sports for employees and businessmen. 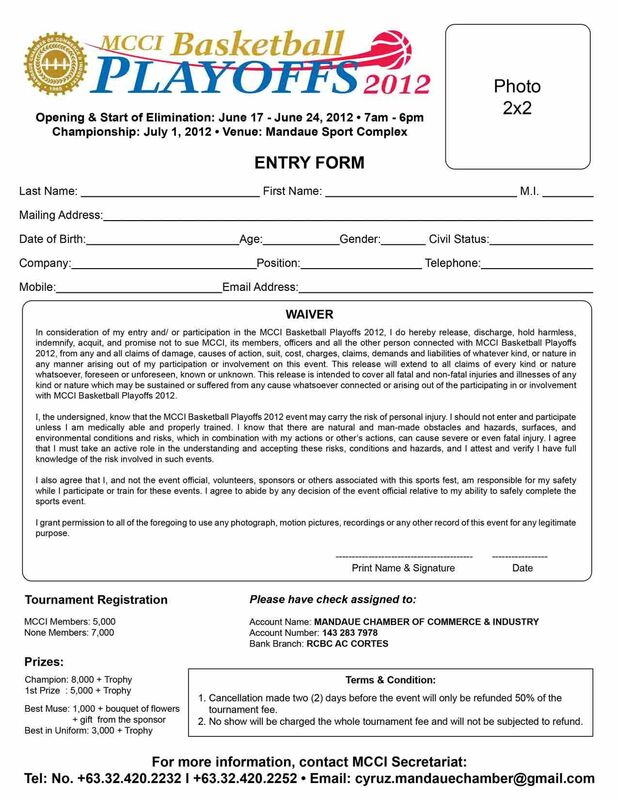 The opening ceremony and first game of the MCCI Playoffs 2012 shall be on June 17, 2012, 8:00 am (Sunday) and Championship shall be on July 1, 2012 (Sunday). Official venue is the Mandaue City Sports Complex, Mandaue City. 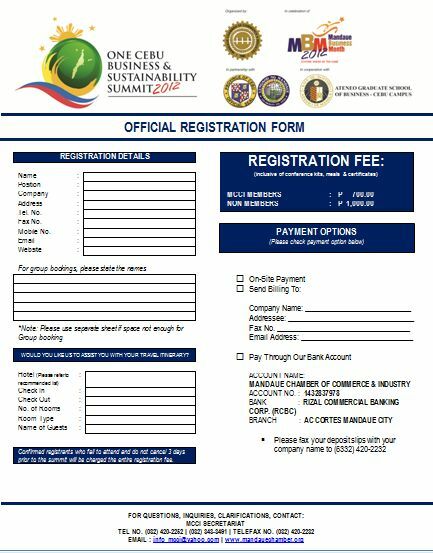 Registration fee is PhP 6,000 per team for MCCI members and PhP 7,000 for none members. A rebate of Php1,000 shall be given to the team having a complete attendance of the members and their muse during the opening ceremony. Cash and trophies/medals will be given to the Champion and 1st place team winners. Also to be given awards are Best in Uniform and Best Muse. We hope that you can participate in this event. This will give your companies public mileage and offer a chance to your employees to engage in a worthwhile endeavour that will boost their productivity. All participating teams shall have at least 12 players but not more than 20 in their official line-up. All participating teams shall have a muse. The team having a complete attendance of the members and the muse will receive a rebate of Php 1000 from their registration fee. The tournament will be using the CeSaFI sanctioned amateur rules in basketball. However, the game shall be played in four (4) quarters at 10 minutes per quarter only or for a total of 40 minutes for the entire ball game. The short tournament shall be divided into four (4) brackets and will be using the double KNOCKOUT SYSTEM rule. Therefore, if a team loses in the first game they still have the chance to play for the second time. If the team wins both games they will have the chance to play for championship game. Game schedule and/or pairing shall be pre-drawn by the Organizing Committee. Only players with the complete official team’s uniform shall be allowed to play. “NO UNIFORM, NO PLAY.” Appropriate jersey numbers must be indicated at the back of the jersey. All players are required to have short fingernails when playing. This is to avoid hurting another player during the game. Players who start, provoke, or initiate a fight shall be automatically thrown out of the game. Unsportsmanlike conduct will not be tolerated. Complaints against the officiating/ game official and/ or any clarification on a questionable call of the on- going game shall be directed only to the Table officials. It shall be evaluated and referred to the Technical Committee only, if necessary. Only the Team Captains are allowed to ask for clarification, verify a point, make a formal complaint against the officiating referee and/ or place the game under protest in behalf of the team during or after the game. However, this shall be done with respect and utmost courtesy and in a diplomatic way. Two (2) technical fouls in a game would mean automatic banishment of a player from the playing court. During the game, the decision of the Officiating referee is final. Only questions and protest on decisions involving TECHNICALITIES shall be entertained by the Technical Committee. Therefore, JUDGMENT CALLS made by the officiating referee is final unless otherwise, reversed by the same official who made the call. BETTING before or during the game is strictly prohibited. Minimum of five (5) players is required for every game. If below 5 players showed up for the team during game time, the game is forfeited in favor of the complete team. A 15-minute grace period will be given to the incomplete team before a formal game forfeiture is declared. NOTE: All contestants must bring one (1) Basketball. This is the vision of the Provincial Government of Cebu and the Philippine Exhibits and Themeparks Corporation (PETCO) as they prepare to open the Cebu Cultural Center (CCC) on March 16, 2012. Les Miserables is a story of Jean Valjean, an escaped convict whose life is transformed and turned toward goodness by an act of Christian charity. It is also a history of Hugo’s time. With wealth of social and philosophical commentary, the work is an eloquent plea for social reform. Jean Valjean was released after nineteen years in prison. He had been sentenced to a term of five years because he stole a loaf of bread to feed his starving sister and family. Jean’s sentenced was increased because of his attempts to escape. During his imprisonment, he astonished others by his exhibitions of unusual physical strength. Freed at last, he started out on foot for a distant part of the country. Innkeepers refused him food and lodging because his yellow passport revealed that he was an ex-convict. Finally, he came to the house of Bishop of Digne, a saintly man, who treated him graciously, fed him, and gave him a bed. During the night Jean stole the Bishop’s silverware and fled. The incident was reported , and the policemen immediately captured him with the stolen goods. Without any censure, the priest did not only give him what he had stolen, but also added his silver candlesticks to the gift. The Bishop told the gendermes that those silverware were given to Jean as present. So, the astonished gendermes let the prisoner go. Alone with the Bishop, Jean was confounded by the churchman’s attitude; though, the Bishop asked only that he should use the silver as means of living an honest life. 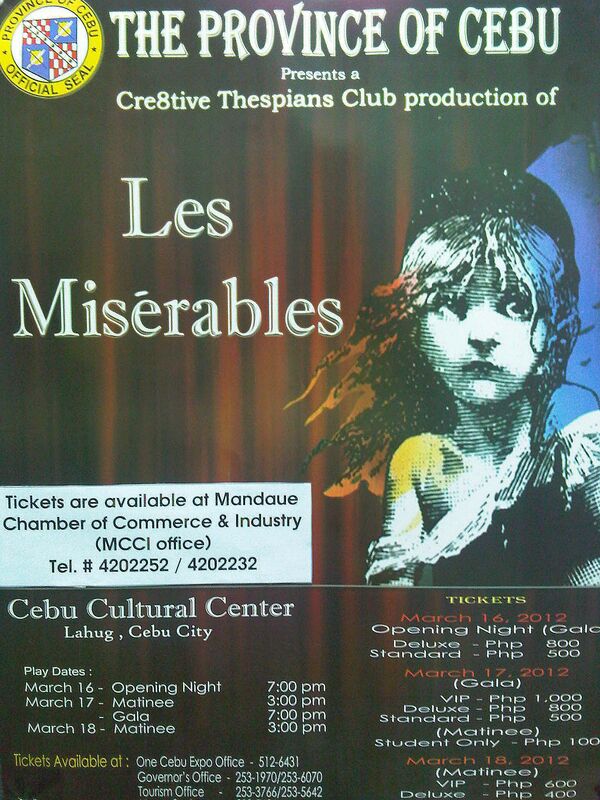 In Cebu Cultural Center Lahug, Cebu City on March 16,2012. 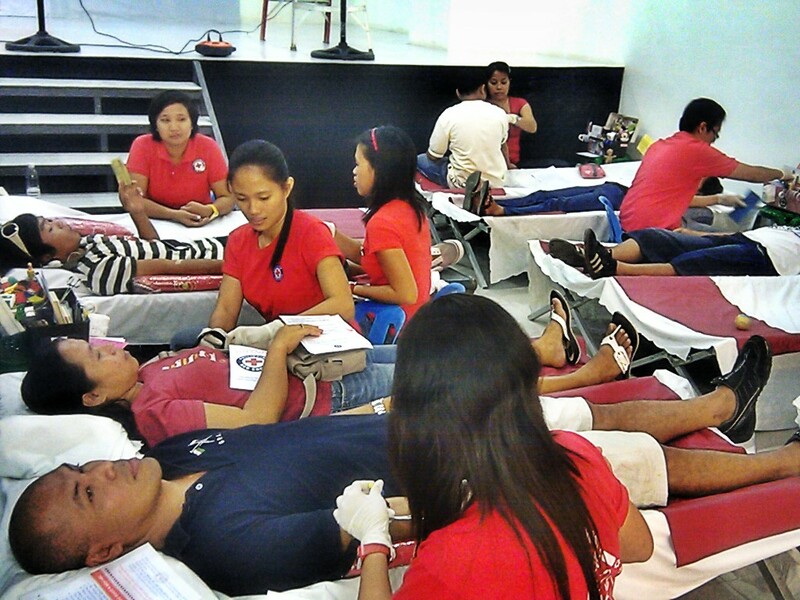 Last year, in partnership with ABS-CBN and incoordination with Philippine Red Cross, we launched the Kapamilya Bloodletting (Bleed for Life) during the MBM 2011 celebration, the event wassuccessful with a total collection of 110 units or 49,500 cc of blood. Presently, the Blood Center is in need of bloodin order to sustain the quality of blood supply to provide the blood needs ofthe patients and to save lives. In line with the Eastern Visayas Regional Blood Center of the Philippine Red Cross efforts to serve more patients in the hospitals, we continue to conduct blood letting activities that aims in helping solve the depleting blood supply in the hospitals, it is likewise campaign edfor personal health benefits of donors-those who regularly donate blood, according to recent studies have a lower risk for heart disease. 1. Have enough rest and sleep. 2. No alcohol intake 24 hours prior to blood donation. 3. No medications for at least 24 hours prior to blood donation. 4. Have something to eat prior to blood donation, avoid fatty food. 5. Drink plenty of fluid, like water or juice. 1. Have your weight taken. 2. Register and honestly and complete the donor registration form. 3. Have your blood type and hemoglobin checked. 4. A physician will conduct a blood donor examination. 5. Actual donation–the amount of blood to be donated (either 350cc or 450cc) will depend on the donor’s weight and blood pressure. It usually takes 10 minutes or less. 6. A 5 to 10 minute rest and plenty of fluid-intake are necessary after donation. What to do after blood donation? 1. Drink plenty of fluid, like water or juice. 2. Refrain from stooping down after blood donation. 4. Avoid using the punctured arm in lifting heavy objects. 5. Apply pressure on the punctured site and lift the arm in case the site is still bleeding. 6. If there is discoloration and swelling on the punctured site, you may apply cold compress for 24 hours. 7. 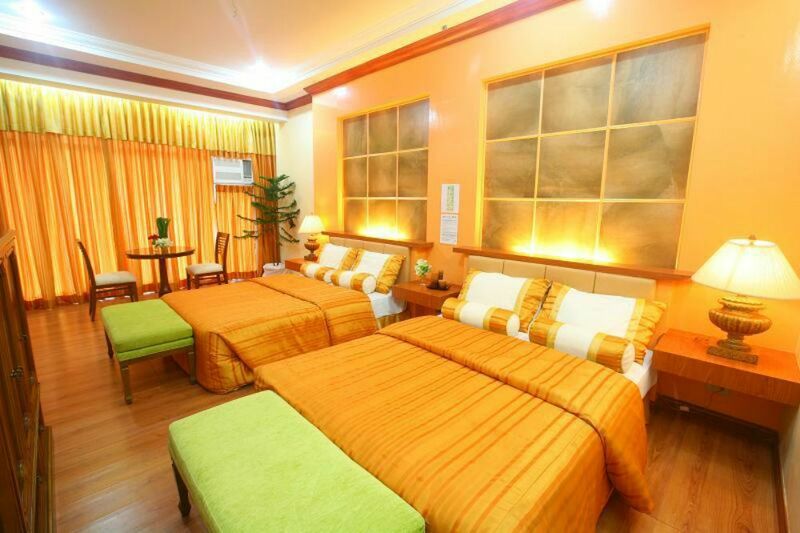 If there is dizziness, just lie down with your feet elevated. Drink plenty of juice; and in just a few minutes or so, it will pass.